Our micro-needling treatments will breathe new life into your skin in just a few short sessions. We use sophisticated, state of the art technology and highly developed techniques to bring this world-renowned dermatological treatment to you. Micro-needling, also known as collagen induction treatment, involves repeatedly penetrating the skin with tiny needles, similar to those used for transdermal vaccinations. The treatment has been used to remedy a number of dermatological problems, such as acne and the scarring that it produces. Dermapen treatments keep the skin firm by encouraging elasticity and the production of collagen. Microneedling is proven to reduce the intensity of dermatological scarring and stretch marks. Through the production of collagen, dermapen treatments reduce and prevent signs of ageing and skin damage. These treatments can produce results similar to those of surgery, but at far less of the cost and with none of the associated trauma. It also ensures minimal downtime once the procedure is completed, unlike surgical procedures which have a lengthy recovery time. These treatments have a versatile range of applications and can be used to treat acne and acne scars, warts, keloids, wrinkles and much more. Microdermabrasion treatments can also be conducted regularly to maintain skin elasticity and health over a long period of time. 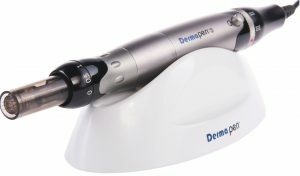 Dermapen treatments generally last about 30 minutes and should be done in a number of sessions to get the best results. During the treatment, anaesthetic cream is first applied to the skin to keep the patient comfortable throughout. 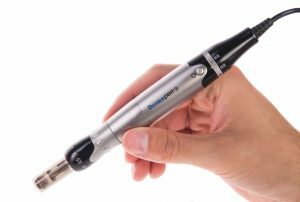 Then, a dermapen is used for the process whereby tiny needles (roughly a millimetre in length) are used to penetrate the skin to facilitate collagen production. Once finished, the client will have a red, sun-burnt look to their skin, which will clear in a matter of days. Who Would Benefit from the Procedure? Those who suffer from skin problems such as excessive build-up of dead skin cells which cause dull or hardened skin. Treatments are well-suited to individuals with acne and sensitive skin. These treatments are appropriate for all age groups. Individuals suffering from dun-damaged, ageing, or oily skin can find the best benefits from this treatment. If you would like to find out more about our various dermatological treatments or would like to opt for our dermapen treatments, contact a representative from Fourways Aesthetics Centre today, or continue browsing our website for further information.